One day, after I started up my game, I've decided to clean up my old saves. Selected some of them, pretty old, pressed "Clear", then Enter and guess what? It deleted ALL MY SAVED GAMES! Fkn THANKS for this awesome and much needed feature! Why does it even exists? Do you have any sane Project Manager in your team? We're sorry to hear you experienced this issue. 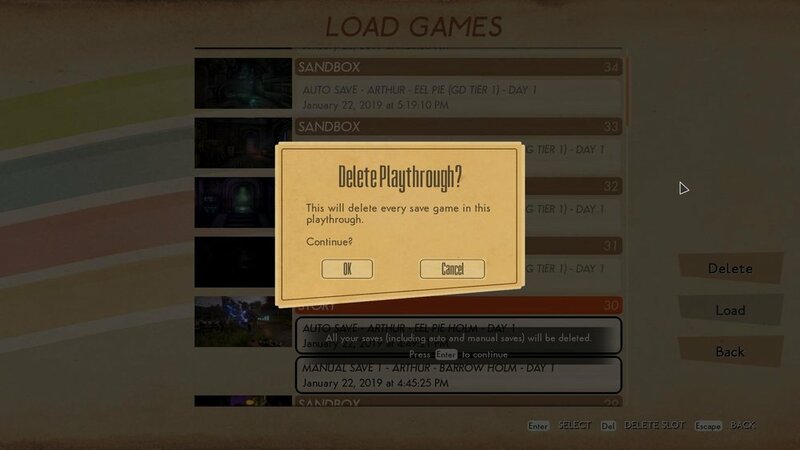 Individual saves within a playthrough cannot be deleted, but the entire playthrough slot can be. This is communicated in the confirmation prompt which appears when you press Delete. Pressing Enter again will confirm the action. For the save games which were deleted, were they all in the same playthrough slot or were they all from different playthroughs? Also, do you know what version of the game you're playing? You can see this in the bottom right of the pause menu.